Levothyroxine is a medicine, licensed by Wockhardt, which is used to treat low levels of thyroid hormones. You can renew your prescription and buy levothyroxine online, you can do so through our online service. 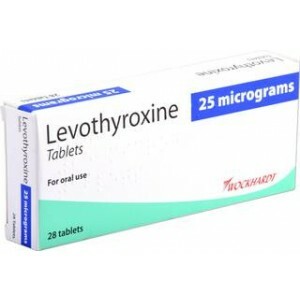 Levothyroxine is a synthetic hormonal treatment which increases the level of hormones in those with an underactive thyroid. The thyroid gland is a butterfly-shaped organ located in the base of the neck. It has two lobes (the butterflies wings) which are connected by tissue in the middle called the Isthmus (the butterflies body). Primarily, the thyroid converts a chemical we ingest called iodine into two hormones - triiodothyronine (T3) and thyroxine (T4). These hormones are pumped straight into the bloodstream. A gland in the brain called the hypothalamus monitors the blood level of the T3 and T4 hormones. If it seems there isn't enough of the hormones in the blood, the three glands work in tandem to increase them. Upon receiving feedback that the blood level of hormones is low, the hypothalamus releases thyrotropin-releasing hormones (TRH). TRH triggers the pituitary gland to release thyroid-stimulating hormones (TSH) which, as the name suggests, stimulates the thyroid to produce more hormones. Primary hypothyroidism can be caused by surgery, during which the thyroid is damaged, or as a result of an autoimmune disease, which is more often the case. Autoimmune diseases cause the bodies natural defence system to attack healthy tissue and cells. If the immune system attacks and damages the thyroid, it can reduce the function of the thyroid. Levothyroxine contains synthesised versions of T3 and T4 which increase the blood level of the hormone and reduce symptoms. The thyroid is an important organ in the body which is responsible for the regulating metabolic and cardiovascular functions. The effect these hormones ranges from increasing the heart rate and strength, regulating cholesterol levels and appetite. The condition is usually diagnosed following a blood test which looks for the blood level of the T3 and T4 hormones. If left untreated, hypothyroidism can lead to complications such as heart problems, mental health issues, peripheral neuropathy, infertility and myxoedema. Levothyroxine works to replace the hormones which your thyroid gland produces, known as T3 and T4. During treatment, regular blood tests will need to be taken. This is to determine the right dosage and to monitor your condition. Once the right dosage has been achieved, you will need further blood tests to ensure the treatment is working effectively. It is possible to have an underactive thyroid without exhibiting any symptoms, though treatment is not usually given in these circumstances. However, treatment may be suggested if symptoms develop. Levothyroxine should be taken once in the morning before food or caffeinated beverages, as these can affect the thyroid. Swallow one capsule with a glass of water. Do not cut or crush the capsule. Always follow the doctor's instructions. Always read the patient information leaflet enclosed with your medicine before taking levothyroxine. Levothyroxine doesn't tend to cause adverse effects unless the recommended dose is exceeded. What should I do if I experience an allergic reaction? If you are concerned about any of the risks listed above, do not hesitate to contact your GP or doctor about your treatment. Will Levothyroxine be affected by any of the medicines I currently take? If you are or planning on becoming pregnant, speak to your doctor before taking levothyroxine. It is generally regarded as safe to breastfeed while taking levothyroxine. Always read the patient information leaflet enclosed with your medicine before taking it. Levothyroxine should not impact your ability to drive or operate machinery. For more information regarding the safety of this medicine, we urge you to read the patient information leaflet. How soon does levothyroxine begin to work? It usually takes between 7 and 10 days for the levothyroxine to be absorbed by the cells. However, it can take many weeks before improvements will become noticeable. What happens if I stop taking levothyroxine? What should I do if I take more levothyroxine than I should? You should never take more levothyroxine than your doctor prescribes. What should I do if I forget to take levothyroxine? If you forget to take your dose of levothyroxine, take it as soon as you remember. If it is near the time of your next dose, skip the missed dose and continue your treatment as normal. Do not double dose to make up for the missed dose. Hormonal contraceptive pills which contain oestrogen can affect the levels of levothyroxine in your body. Your doctor may need to change your dosage of levothyroxine if you start or stop taking contraceptive pills. How long will I need to take levothyroxine? You will need to take levothyroxine indefinitely. Ceasing treatment early will most likely cause your symptoms to return. Is it safe to take levothyroxine for a long time? Yes, it is safe to take levothyroxine for a long period, so long as you follow your doctors prescription.